Over the weekend we continued with what was going to be the Second Campaign. Still is...but I'll get to that. The boys made some new characters and we started the "Treasure Hunters" group. Overtly this group is getting together to hunt treasure. We have a band centered around "an expert treasure hunter" (a ranger), a cleric of the god of Knowledge and warlock. Joining the group is my favorite character to date, a gnome druid named "Erky Timbers", played by my youngest. I took them through U1 The Sinister Secret of Saltmarsh. We had such a great time we played for about 10 hours, only stopping to quickly grab a bite to eat. We played it under 5e and I used +Mark Stout's "Classic Modules Today" conversion of U1 to help us out. Though this proposes and interesting problem for me. 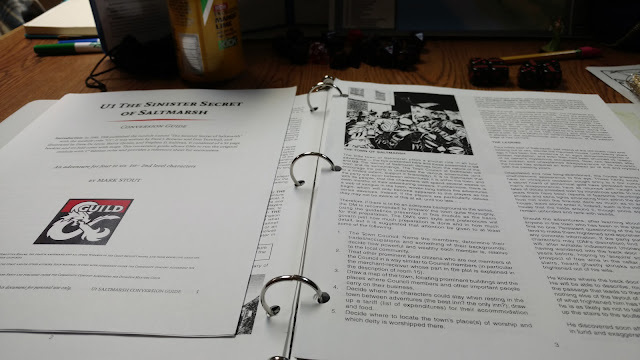 This is the adventure I wanted to use to start the "Second Campaign", the one that runs parallel to the "Come Endless Darkness" campaign. At some point, after 15th level, the survivors of both campaigns will come together to fight a larger evil. 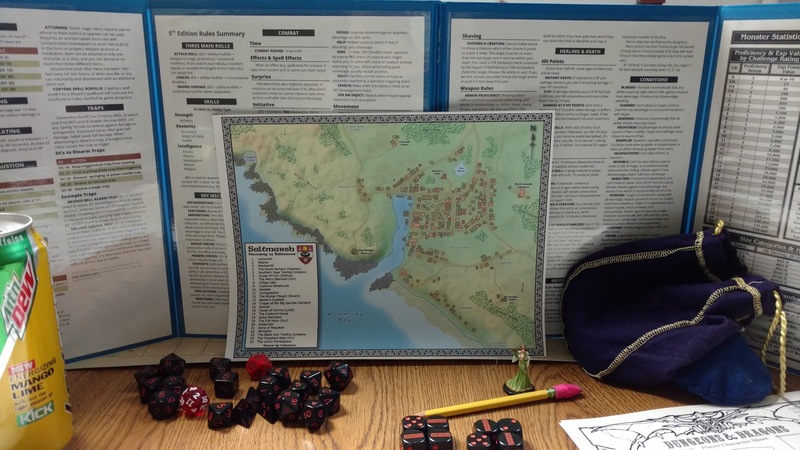 I supposedly started the Second Campaign back in March with the Forgotten Realms. But so far we are only one adventure and two sessions into that one. Plus that one is in the Realms, the Come Endless Darkness is very much Oerth/Greyhawk. So. I might change that game to a simple "Into the Forgotten Realms" game and pick the Second Campaign Game up here in Oerth. I was vague on where Saltmarsh actually was, so I can still decide. Given the adventures, I am pretty sold on it being in Greyhawk. With a break right after I4 for the Council of Greyhawk. This group will be sent to the desert but unlike the Order of the Platinum Dragon the Treasure hunters will not be transported back. This could end up being quite epic. Hope I am able to get it all done. Sounds great; I will be following with interest because I'm currently planning a Saltmarsh/Slavers campaign right now. I plan on adding modules like Isle of Dead and other oceanic/tropical adventures as I can. Unless the players opt to head for the desert and then my list looks more like yours!